Well, here’s an airport moving in the right direction. Washington’s Spokane International Airport, which serves about 3 million passengers a year, is now offering travelers free Wi-Fi (well, for 20 minutes..) inside the Terminal Building and, starting in September, will be providing baggage carts at no charge. “In today’s climate, people are unhappy with the pricing models of air travel companies and are suffering from declines in customer service,” said airport director Lawrence Krauter. Just the beginning? Wonder what will come next? Maybe a circus, like the one offered each year at Dusseldorf International Airport. Or a miniature golf course, like they have at Florida’s Palm Beach International Airport. After all, this is the airport that serves as the gateway for the Spokane Fantasy Flight to the North Pole each December for 60 kids and their elf escorts – so you know they know how to have a good time. There’s a fresh piece of art at Spokane International Airport in eastern Washington. But you’ll have to look up to see it. Louise Kodis’ new textile sculpture “Conversations Between Clouds” in now installed in the rotunda of the airport. The sculpture is a flock of three dimensional floating shapes suspended under the ceiling and is made out of bamboo rod, curved acrylic rod, colored and textured silks and synthetic fabrics. Ken Yuhasz’s Aer•O•Toaster was installed in 2009. Yuhasz says his toaster is based on the classic Sunbeam toaster from the 1930s and the ‘Flying Toaster’ used as a screen saver on countless computer screens during the 1980’s and is a re-creation at one-half scale of a Gee Bee racing plane from the early 30′s. Traffic was slow heading into Spokane International Airport on Friday because most drivers had their eyes on the sky. I don’t blame them: the USAF Thunderbirds and other military flight demonstration teams were practicing for this weekend’s Skyfest 2010 at Fairchild Air Force Base. Inside the airport, flights were delayed while practice flights took place. So there was plenty of time to shop for souvenirs. 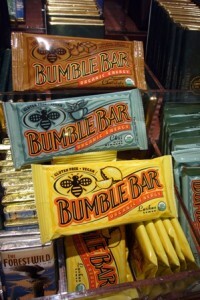 Unfortunately, I wasn’t in the concourse with the Simply Northwest store, which is filled with a wide variety of local and regionally made items such as wine, chocolates and Bumble Bars. Nope, I was in the other concourse. The one with just a small souvenir section in the newsstand. I’m really not sure what makes this an appealing food or souvenir item, but we’ve seen Cardinal Poop (Indianapolis), Pelican Poop (Fort Myers, FL) and Armadillo Droppings (throughout Texas). So it’s no surprise that at Spokane International Airport, there’s an entire shelf of Moose Poop and Bear Poop. Next time you’re stuck at the airport, check out the souvenirs. If you find something that’s about $10, is “of” the city or region and is a bit offbeat, please snap a photo and send it along. Your souvenir may end up featured on Souvenir Sunday at StuckatTheAirport.com. And if it is, you’ll get a fun souvenir from us. The security checkpoint at Spokane International Airport is usually a quiet, orderly place. But earlier this month “It was a mad house,” says TSA screener Julee McCully. Carolers were crooning Christmas classics in the terminal lobby. Eighty of Santa’s elves were trying to get sixty kids from this year’s “nice” list through security for secret Alaska Airline’s Flight #1225 (get it?) to the North Pole. And alarms kept going off at the metal detector. Elves? A secret flight to the North Pole? What is this, a Hallmark/Homeland Security Christmas special? Well, yes. Sort of. Thanks to the efforts of airline and airport employees, the TSA, sponsors, donors, and an army of secret Santas, planeloads of seriously ill and/or disadvantaged children have been taking off for the North Pole not just from Spokane, but from Chicago, San Antonio, Phoenix, and a sleigh-load of other cities around the country as well. What happens at the North Pole? Embedded as an elf (that’s me on the left, Tammikins on the right), I was able to tag along this year on the North Pole flight organized by Spokane Fantasy Flight, a non-profit group that invites area shelters and community programs to pick a group of kids who could really use “an evening of wonderment and surprise” and a huge pile of presents. 60 kids and a troop of elves set off for a 40-minute flight to the North Pole, which is actually (spoiler alert!) a decorated hangar at the airport populated with Santa and Mrs. Claus, loads of extra elves and, of course, a few reindeer. Don’t worry: Alaska Airlines hasn’t put United Airlines out of the North Pole business. Not by a long shot. To find out about the North Pole flights organized by employees from United and Continental Airlines, please see the full column Now Boarding Flight 1225 to the North Pole on MSNBC.com. On Saturday, while everyone else was plotting how to get a first view of the 787 Dreamliner during its (probable) Tuesday test flight, I joined a group of children from Spokane for a flight to the North Pole. 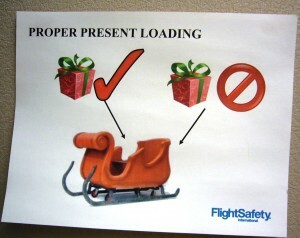 One of the perks of being welcomed into the elf brigade for the night was a visit to Santa’s flight center, where I was able to snap photos of these very important internal memos.